Exclusive Lifehacker download for Windows: Gmail Keys adds Gmail-style keyboard shortcuts to Microsoft Outlook—saving you time when dealing with email overload if you use both regularly. Once launched, you can start using the shortcut keys immediately—just start out with the J or K keys to move up and down in the list, use the O key to open the message or the / key to search. 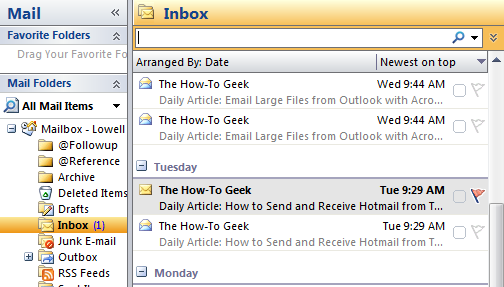 (In Outlook, of course, yo can use the arrow keys, Enter and Ctrl-F for those features.) They should work almost exactly like the Gmail keyboard shortcuts. The utility should run completely in the background, and you can add it to your startup folder to keep it running after reboot. The one special case is enabling the archive key, which will require installing the included Outlook macro using our guide to adding a Gmail-like archive button to Outlook. When creating the button, add &. to the button text, which will enable the trigger. For instance, if your button is called Archive you would rename it to Archive&. (with the ampersand and period). r: Reply to the message. /: Focus the instant search box. c: Open a new message. j: Move down in the list to the next message. k: Move up in the list to the next message. Shift+j: Move down in the list, selecting the next message as well. Shift+k: Move up in the list, selecting the next message above as well. Shift+i: Mark the message as read. Shift+u: Mark the message as unread. s: Mark the message as flagged. v: Open the Move message dialog. Period(. ): Open the message context menu. All credit goes to Lifehacker reader jayp, who not only came up with the idea and put together the original script but graciously released it as open-source so we could provide it for you here. Thanks! Gmail Keys for Outlook is a free download, Windows only. If you are an AHK user, you can grab the source code from the download folder and paste it into the script that you use daily. Otherwise, just launch the executable and optionally add it to your startup folder.